Don't stay thirsty, my fitness friends. Proper hydration is vital to your workout performance and health. Dehydration is one of the most popular practices weight-class athletes and bodybuilders use to help shed the last few pounds. In a quest to make weight or come in with a more defined physique, athletes will restrict water intake, perform cardio in head-to-toe sweats, or melt away in a sauna, all in an effort to sweat out an extra pound or two. While you may see the number on the scale go down, or a little more definition in your muscles, dehydration can have a significant impact on your performance. If you want your muscles to work properly, you need to keep them hydrated. 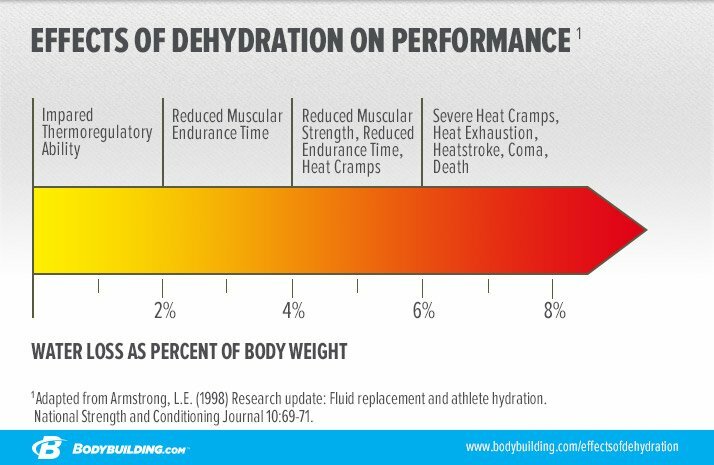 The bottom line is that dehydration can have a significant effect on performance. Anyone, from runners to lifters, can become dehydrated if fluid loss is greater than fluid intake. It's as simple as that. And dehydration can lead to reduced performance, headaches, fatigue, and muscle cramps. According to Dr. 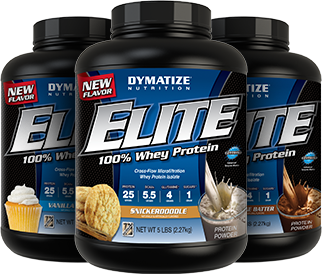 Rob Wildman, Chief Science Officer of Dymatize Nutrition "there is a lot that we know about how water or hydration status impacts strength performance and training results. Most of the research to date has focused more on endurance athletes. We need to better understand how muscle cell hydration status impacts acute strength training as well as long term benefits." Now in three delicious new flavors: Snickerdoodle, Vanilla Cupcake, and Chocolate Cake Batter! Go Now! How Much Fluid Do You Need? Just drink eight cups of water a day and you should be fine, right? Not necessarily. The well-known recommendation is a bit outdated and doesn't take into consideration factors that can increase fluid intake. Generally speaking, women require about 90 ounces (11 cups) per day, while men should be getting around 125 ounces (16 cups) per day. "While you'll meet some of your fluid needs through foods, about 80 percent of your recommended intake will come from beverages including soft drinks, coffee, tea, and milk" says Dr. Wildman. If you do any workouts that cause you to sweat, you'll need to increase your water intake to compensate for the fluid loss. Workouts under 60 minutes require an extra 2-3 cups of water. Workouts that are longer, more intense, or both will require more fluid intake. How much will depend on how much water you lose via sweat. An easy way to track this is to weigh yourself immediately before your workout and then again right afterward. For every pound of body weight lost, drink an additional 2-3 cups of water. What Other Factors Influence Hydration? Although rare, it is possible to overhydrate, a condition called hyponatremia. For example, endurance athletes who only consume water during long duration training bouts can mistakenly overhydrate in an effort to maintain a high performance level. Drinking too much water can cause electrolytes (sodium and potassium) to become diluted to dangerous levels. Sports drinks that contain electrolytes, such as Gatorade, can help prevent this. You don't feel it when you're watching a movie on an airplane, but as you climb higher in elevation, the temperature outside drops. While you may sweat less, the lower air pressure and low humidity means evaporation of moisture from your skin is accelerated. Even though you may not notice much sweating, you are still a likely candidate for dehydration. Higher altitudes will also increase the frequency of bathroom visits. As a means to avoid dangerously elevated blood pH at high elevations, you'll pee more. Also, in colder temperatures, your body tries to conserve as much heat as possible. Rather than spending energy heating up fluids in your body, your body eliminates as much fluid, in the form of urine, as possible. Hot or humid climates can increase rates of water loss. When air is humid, sweat can't evaporate and cool you as quickly as it normally does. This results in a higher body temperature and the need for more fluids. Conversely, in colder climates, there is less moisture in the air, requiring additional intake of fluid to replace fluid loss. The intensity and duration of your workouts has a positive relationship to fluid needs. The more intense a workout is, and the longer the duration, the more fluid you will need to replace what is lost in sweat. Additionally, the more muscle groups that you use, the more energy your body requires, and thus the more water you will need. What's The Easiest Way To Prevent Dehydration? It sounds totally obvious, but start by drinking fluids when you're thirsty. Thirst may not be the most reliable indication of hydration status, but it's a start. The color of your urine also offers insights into your hydration status. If the urine in your toilet bowl is light to clear, you're probably all right. If it's the color of apple juice, it's time to make a trip to the water cooler and increase your daily fluid intake. 2 to 3 hours before your workout, consume 2-3 cups of fluid; it doesn't have to be just water! 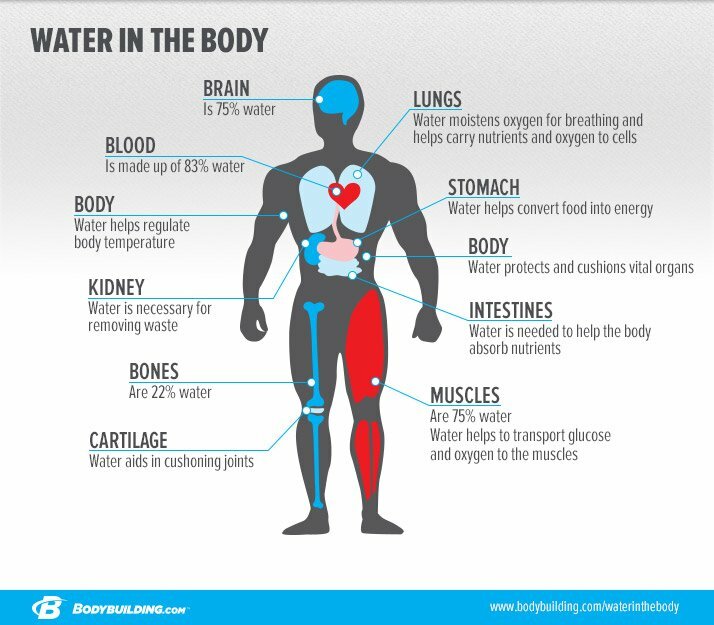 While water is a great choice, you can also sip juice, milk, or some BCAAs. During exercise, try to drink about one cup of fluids every 20 minutes or so. If you're a heavy sweater, you may want to opt for a drink with a higher electrolyte concentration. This amount will increase if you're training in hot, humid climates, or training at a high intensity. Avoid drinking large amounts of water at one time. This can actually slow down the digestion and absorption of fluids, leaving you with a gut full of fluids. Any Final Pointers I Should Bear In Mind? Water is a perfectly suitable option for workouts that last under an hour and are done in a relatively cool environment. But for longer activities, or workouts done in hot, humid climates, Dr. Wildman recommends using a beverage with added electrolytes. Electrolytes, include sodium and potassium, can be lost during exercise through sweat, leading to an increased risk of muscle cramps, fatigue, nausea, and mental confusion. "Look for drinks that contain 120-170 milligrams of sodium and 45 milligrams of potassium per eight ounces to make sure you're getting a good supply of electrolytes." Water is a perfectly suitable option for workouts that last under an hour and are done in a relatively cool environment. But for longer activities, or workouts done in hot, humid climates, you're better off using a beverage with added electrolytes. Adding glycerol to your pre-workout beverage may also help to keep you hydrated during your workouts. It should be stressed that pre-exercise glycerol "hyperhydration" should only be used if the workout is likely to cause a 2 percent loss in body weight. So if you're just planning on hitting the weights for an hour or so, skip this step. 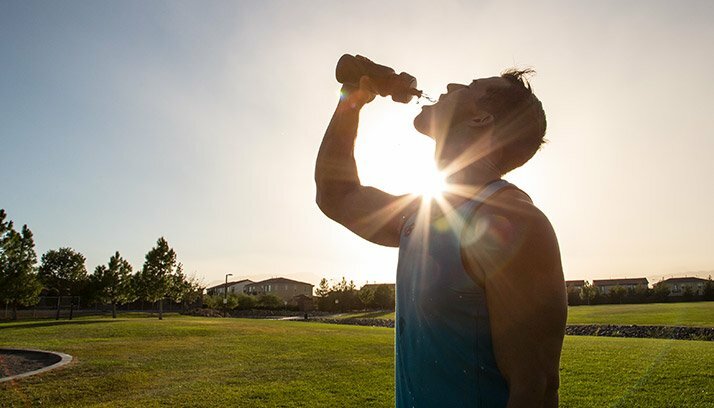 For those athletes engaging in longer duration activities with limited access to water breaks or training outdoors in extreme temps, Dr. Wildman suggests adding glycerol to help maintain hydration status throughout the workout. It's recommended that you add 0.5 grams of glycerol per pound of body weight to a beverage equal to 0.4 ounces per pound of body weight.6 "For example, a 170-pound athlete would add 85 grams of glycerol to 68 ounces of their choice beverage. The solution should be consumed over a 60-minute period," he says. Staying hydrated doesn't have to be complicated. Stick to the simple guidelines outlined above to experience optimal performance in the gym. Stover, E. A., Petrie, H. J., Passe, D., Horswill, C. A., Murray, B., & Wildman, R. (2006). Urine specific gravity in exercisers prior to physical training. Applied Physiology, Nutrition, and Metabolism, 31(3), 320-327. Davis, J. K., Laurent, C. M., Allen, K. E., Green, J. M., Stolworthy, N. I., Welch, T. R., & Nevett, M. E. (2015). Influence of Dehydration on Intermittent Sprint Performance. Journal of Strength and Conditioning Research, 29(9), 2586-2593. Savoie, F. A., Kenefick, R. W., Ely, B. R., Cheuvront, S. N., & Goulet, E. D. (2015). Effect of Hypohydration on Muscle Endurance, Strength, Anaerobic Power and Capacity and Vertical Jumping Ability: A Meta-Analysis. Sports Medicine, 45(8), 1207-1227. Kraft, J. A., Green, J. M., Bishop, P. A., Richardson, M. T., Neggers, Y. H., & Leeper, J. D. (2010). Impact of dehydration on a full body resistance exercise protocol. European Journal of Applied Physiology, 109(2), 259-267. Judelson, D. A., Maresh, C. M., Farrell, M. J., Yamamoto, L. M., Armstrong, L. E., Kraemer, W. J., ... & Anderson, J. M. (2007). Effect of hydration state on strength, power, and resistance exercise performance. Medicine and Science in Sports and Exercise, 39(10), 1817.
van Rosendal, S. P., Osborne, M. A., Fassett, R. G., & Coombes, J. S. (2010). Guidelines for glycerol use in hyperhydration and rehydration associated with exercise. Sports Medicine, 40(2), 113-139.